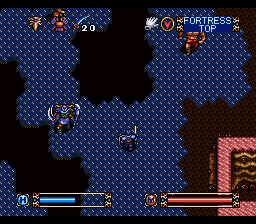 Brandish is a series of overhead dungeon crawlers from Falcom. 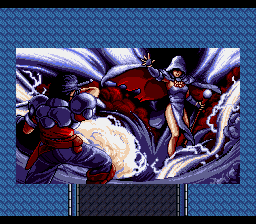 Like most of their games, it began on Japanese PCs, though the first game was ported to a few consoles, and the SNES version was even localized. 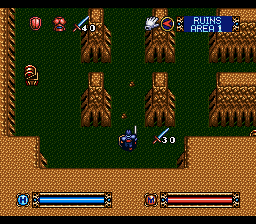 The sequel was ported to the Super Famicom; the subsequent games were only for computers. The “final” game is a remake for the first game, released for the PSP in Japan in 2009, and brought to North America six years later in 2015 by XSeed. The series is known for its rather unique (and uniquely infuriating) perspective. 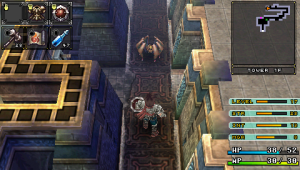 Instead of the character turning left and right, the player characters are always facing upward, and the world rotates around them. 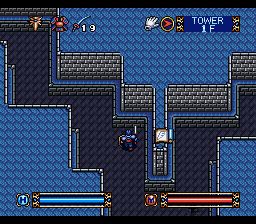 It’s sort of like if you took a typical first person dungeon crawler like Dungeon Master, but from an overhead viewpoint. 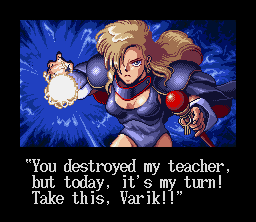 Needless to say, the first time one plays a Brandish game is massively disorienting. 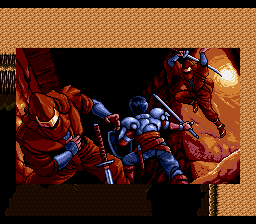 Since the game was created on early 90s PC hardware, the movements are tile-based and aren’t at all smooth, and the whole world shifts suddenly at 90 degree angles every time you turn. To say that it requires an adjustment period is being kind. 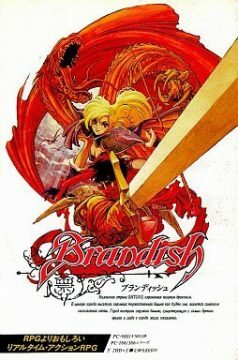 Beyond that, Brandish is fairly classical. You pilot your character, square by square, scavenging for weapons and magic, finding keys, flipping switches, hunting for walls to smack with a sledge hammer, looking for illusionary walls you can walk through, using steel balls to uncover hidden traps and smacking bad guys, all to advance to the next level. Your inventory is limited, so resource management is extremely important, especially in deciding what to keep and what to sell. Occasionally you’ll be asked to solve some relatively simple puzzles, which are usually spelled out via helpful plaques all over the place. 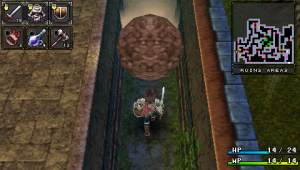 You’ll also have to deal with traps, which include everything from arrows to gigantic boulders. 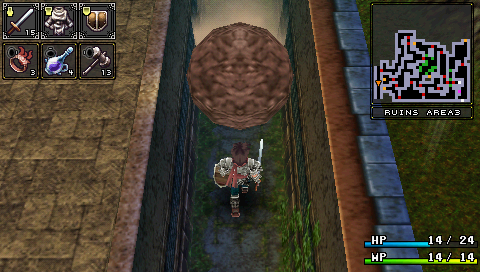 Those giant rocks can kill you immediately, so you’d better be careful! 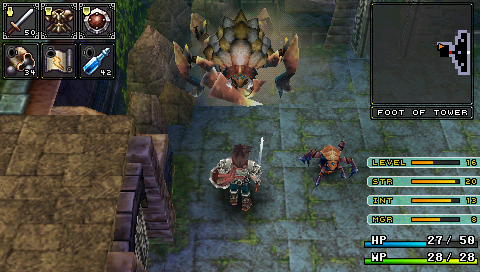 You’ll need to fight monsters too, of course. 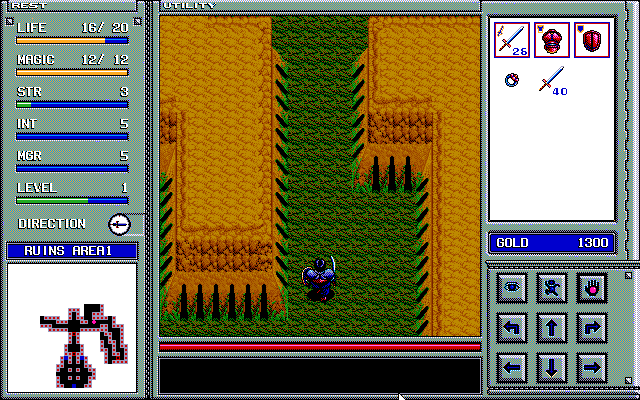 The action takes place in real time, but since the movement is still grid-based, it still has a turn-based feel. In other words, walking up to an enemy and hammering the attack button won’t do much good, because they’ll simply attack you back with every strike. So, you need to be strategtic, in finding places to corner or effective execute hit and run tactics. The game only lets you see elements that are directly in view of the character, so they can’t magically see around corners or through walls. Weapons and armor are usually breakable, but replacements are easily found everywhere, and fighting with your fists can actually work pretty well too. Magic is cast via scrolls and rings. Shops are also hidden throughout, in case you need to restock. There are levels, increased by fighting enemies, but these only affect your maximum HP and MP. Otherwise, each statistic – Arm Strength (physical attack power), Knowledge (magic strength) and Magic Endurance (magic defense) – is leveled separately by performing the appropriate actions, like hitting enemies with your fists or taking magic damage. 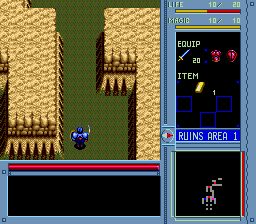 Thankfully all of the Brandish include an automap, one of the few things that helps from keeping the exploration from becoming too dizzying. There’s also a “rest” function that allows you to regain all of your HP and MP at any time – although doing so leaves you defenseless, so you’d better only nap when there’s no bad guys around, or else they’ll kill you instantly. On that note, you can also save pretty much everywhere. 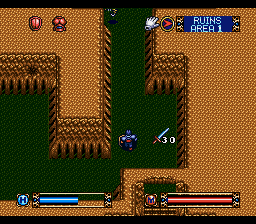 The PC versions of Brandish also boast mouse control, where you can move forward, backward, turn, strafe, and attack by clicking on various boxes surrounding your character. Some versions also include an “auto-move” function, that allows pick a spot on the map and have the CPU automatically guide you to the indicated location. It doesn’t work quite as well as one would hope – anytime they come across a door, or a pit, or a monster, they’ll stop in their tracks and let you take over. 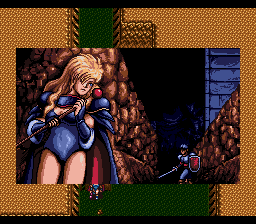 In the first Brandish, you’re a warrior named Ares who’s being chased by a scantily clad sorceress named Dela. 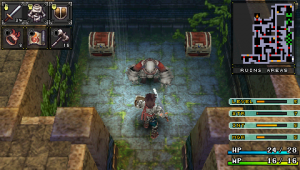 During a quick scuffle, you both end up falling deep into a dungeon, and need to escape. Like most of these older dungeon crawlers, there’s no other real storyline. 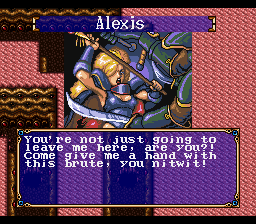 There are some comical encounters with Dela, as she attempts to capture Ares and just ends up foiling herself, though you can choose to help her near the end, which affects the finale. There are some shopkeepers to talk to and some other minor characters throughout, but otherwise it’s mostly a solitary affair. 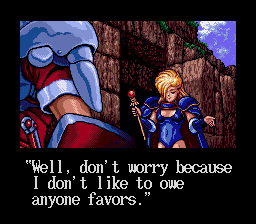 Ares (or Varik, if you’re playing the English translation of the Super Nintendo version) is basically you. That’s why you never really get a good look at your character’s face, at least in the original versions. Ares enjoys sword, knuckles, and taking long naps which will get him killed, if he’s not careful. According to Falcom’s English page, Dela (known as Alexis in the English translation) was voted one of the most popular characters for two years consecutively. 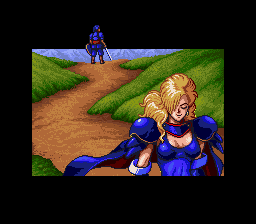 It’s a bit odd that she’s on the cover of the first two Brandish games, but is actually something of a half-nemesis, as she’s chasing after Ares for killing her master, and she isn’t playable until the third entry. As expected of one who dresses in metal bikinis, Dela likes whips, and also a bit of magic. 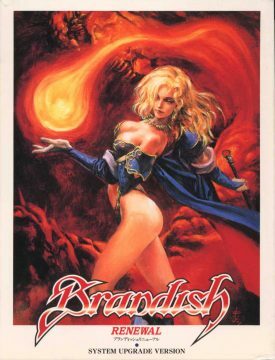 The original Brandish is a straight dungeon crawl through forty five different maps. Every ten maps or so the tileset changes – you starts at the Ruins, then work up through to the Tower, the Cave, the “Dark” zone (where most everthing is covered in black…this is the shortest area, thankfully), and finally the Fortress. 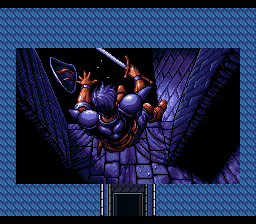 The graphics in Brandish are a little plain, and they are fairly repetitive, though that’s to be expected given the genre. The music is much more laid back and atmospheric than most of Falcom’s soundtracks, with the exception of one of the ending songs, which sounds like it could belong in an Ys game. It’s very good, but again, given the style of gameplay, it does grate after awhile – each area has one song, and if you figure each floor takes at roughly half an hour, then that’s at least five hours of listening to the same three minute song on loop, with only a few pieces here and there to break things up. A “Renewal” version for the PC98 has the ability to be installed on the hard drive features better (and more) music tracks. One of the original songs was deemed too close to Joaquin Rodrigo’s “Concierto de Aranjuez, Movement no. 2 Adagio”, so it was changed. There are some other balancing tweaks too. 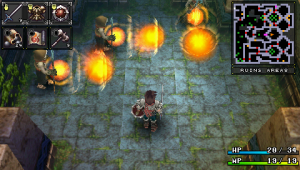 Particularly, in the original version, you could attack enemies, run away, rest, then attack again. This version changes it so enemy’s regenerate health along with you when you rest, so you can’t pull this off anymore. 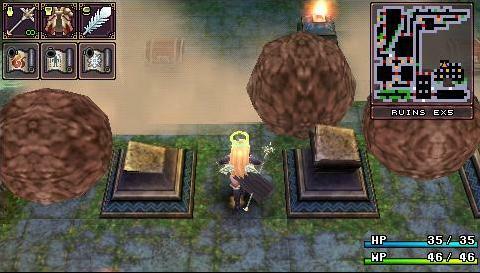 The visibility of traps have improved and it includes the automatic movement function that was introduced in the second game. 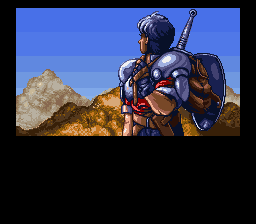 This and both sequels were also ported to MS-DOS in Korea by Mantra, who also made the remake Ys I Special, as well as several other IBM PC ports of Japanese computer games. 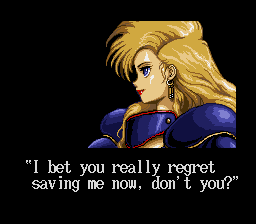 Most non-Japanese gamers are probably the most familiar with the SNES version, which was ported and localized by Koei. Unfortunately, the game speed feels completely off – it’s either too fast or too slow, depending on your settings – and inventory management is a complete and total nightmare, especially when trying to change equipment in real time. The PC versions take place in a window, and in the SNES version, the view has been expanded to take up the whole screen. 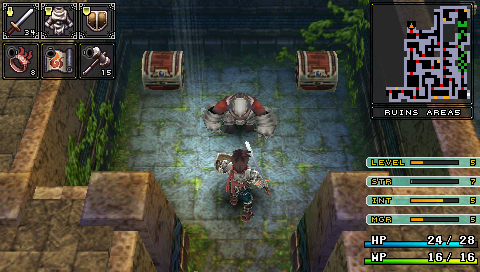 While less cramped, not having an automap in the corner is completely maddening, since you’ll be flipping back and forth between the dungeon view and full map almost nonstop. 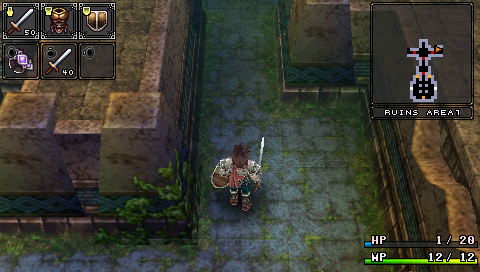 The graphics are similar, but drawn at a lower resolution. 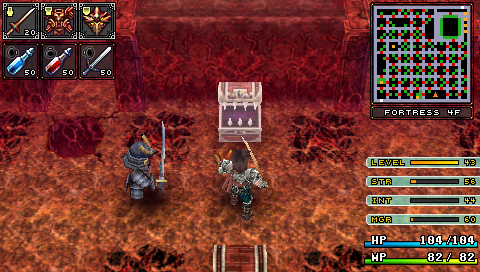 Koei added a “talk” option, that lets you gab with the shopkeepers a bit. 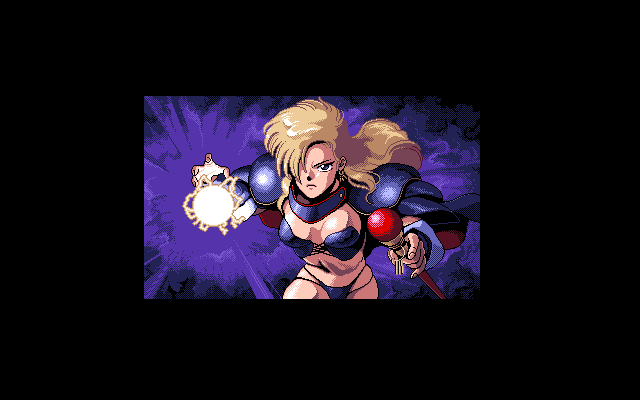 Naturally, Dela’s outfit had been changed to be less revealing, in keeping with Nintendo of America’s standards at the time. 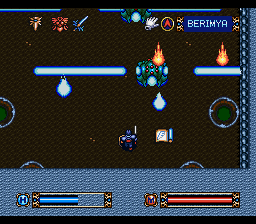 The PC Engine Super CD version, ported by NEC, features the gameplay in a smaller window (much like the computer version), complete with an automap, but it looks worse than the SNES versio. 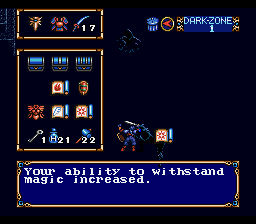 The controls had to be simplified a bit due to the lack of buttons on the PC Engine controller – in some ways, this actually works to the game’s advantage, especially since the game pauses when you enter the equipment screen. The sparse cinematics are voiced, and the redbook soundtrack is alright, but not fantastic. The instruction manual also advertised a contest based on your performance at the end of the game. In addition to its usual PC publishing business, Falcom found some measure of success with the PSP, starting with Gurumin in 2006. They also began remaking some of their older games, like Vantage Master in 2008, and eventually Brandish in 2009, with the subtitle The Dark Revenant. 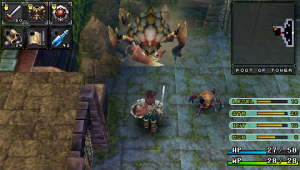 The game was localized into English by XSeed and distributed digitally through the PSN in 2015. It’s a complete overhaul with 3D graphics, although the actual dungeons, puzzles, and basic mechanics are more or less the same. 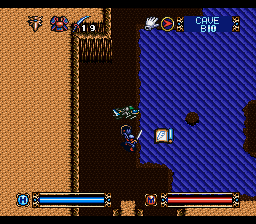 The biggest issue with the Brandish games have always been the jerky way in which the viewpoint rotates. 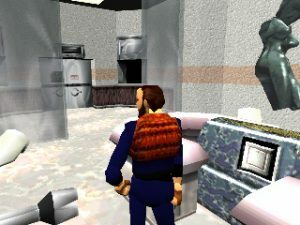 But with the game in full 3D, the world now spins smoothly via the L and R triggers. The movement is still tile-based, but it still looks and feels much, much smoother, which in turn makes combat far more manageable. The viewpoint is slightly skewed compared to the straight overhead perspective of the original, but the field of view is about the same. Unlike some of the other ports there’s no speed up option, so it does feel a little slow, but the animation for both movement and combat is much more fluid. 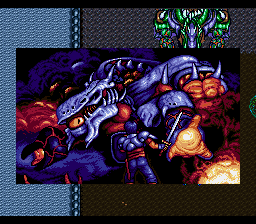 There are still boss battles, and while they’re still a little awkward given the control scheme, their attack patterns have been completely redesigned. The new graphics are appropriately atmospheric and moody; the new character artwork is fantastic, like the covers to the original games, are closer to Western fantasy art than the Japanese manga designs that were found in the in-game cutscenes. You can choose between the original PC-98 soundtrack and a brand new arranged soundtrack, which is excellent. A new introduction song is added too, though it’s much higher tempo than the rest of the music. The interface is easy to use, and the automap is transparently displayed over the screen, making it easy to navigate. Each of the shopkeepers is unique too – it speaks to the level of detail Falcom put into this. Also new are casinos, where you can play the Blade card game from the Kiseki series. 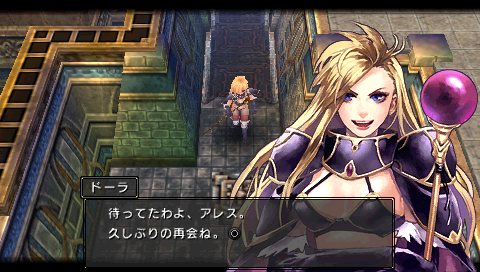 A few minor characters from Brandish 4/VT cameo here, including Effina as the dealer and Yunyun as the bunny girl. After clearing Ares’ quest, there’s also a new brand quest where you play as Dela. 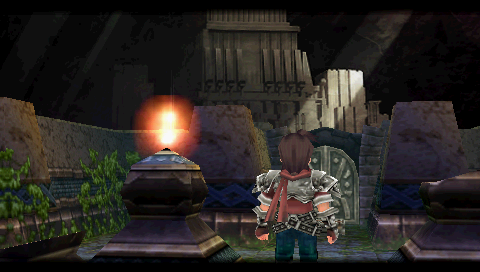 There are ten brand new maps, though they’re expert level dungeons that take a substantial amount of time (and probably many deaths) in order to clear. 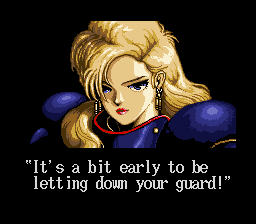 In short, the technical shortcomings of most of the original Brandish releases were a huge hurdle for enjoying the game for many people. With nearly all of these issues resolved, it has become much more playable without the need for dramamine, and is easily the definitive game of the series, even though the sequels add many more other features. A variety of well known artists provided works for various versions of Wizardry. 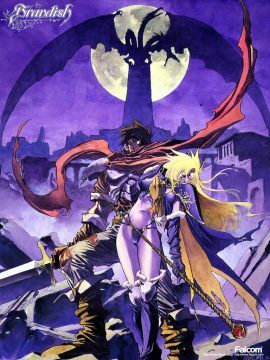 Isutoshi, who later rose to some fame for his work on ero manga, provided some art, and Noboteru Yuuki, later known for Escaflowne and Chrono Cross, did some of the covers too, including the PC Engine game. Jun Suemi, who illustrated many pieces for the Japanese Wizardry titles, created a few pieces, including the one used on the PSP cover.